Rings on the bishop’s chaplain’s fingers and a choir singing almost in tune distracted our reporter. My local Cathedral, where I once attended Sung Eucharist or Evensong on most Sundays, though not for some time now. I can confirm that the regular congregation does indeed chatter loudly before and after services, and also during Communion. They're mostly old enough to know better. I even had to ask two of the stewards to stop talking during the post-Evensong postlude one day. I'm surprised to hear that the choir was a bit off - they're usually pretty good. Rochester isn't particularly low-church, and incense is (or used to be) used on High Days and Holy Days, including sometimes at Evensong, so perhaps the thurifer was on holiday last weekend. OTOH, they've got a fairly new Precentor, so maybe things have gone down the candle a bit recently. Lastly, the Bishop's regular chaplain is a lady priest who tends to wear substantial Doc Marten style footwear, so it would be difficult to see how many rings she has on her toes! I wonder if the chaplain at this service was a substitute? Oh good Lord. Fetch Miss Amanda her smelling salts, there's a sweet lamb. I visited there for Evensong almost a decade ago and walked away having purchased a CD. Fine music memories and a CD I still put on at Christmas. Great and engaging report; thank you Bunbury O'Remus! Glad you enjoyed it, Climacus - come again soon! 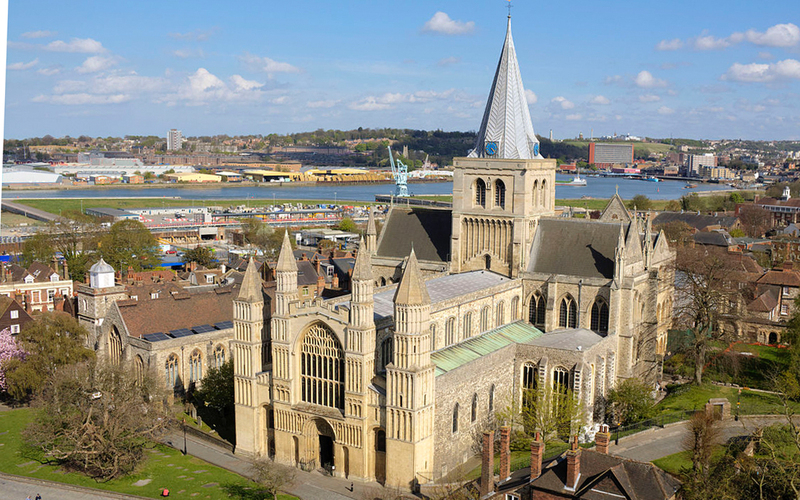 As I said, the choir is usually of a very high standard, as one would expect from a Cathedral, but Rochester is not one of the biggest (or wealthiest). O, (and a little in defence of my local fane), the regular congregation - at least at the Sunday Sung Eucharist - is by no means mainly elderly! The wife of the current Dean has worked very hard, with help from numerous others, over the past several years to establish and build up a significant family/Junior Church presence, to the extent that, when the youngsters join the main congregation at The Peace, numbers are swelled by 30-40 children and 10-20 accompanying adults. Remember - this is a smallish cathedral, with lively local parish churches (and churches of other denominations) nearby. The nave is usually fairly full on a 'normal' Sunday morning, but, unless it's a special occasion, or there are numerous visitors, the afternoon Evensong congregation consists mostly of the choir! Glad you liked the report Climacus; and Bishops Finger is right to add a caveat to my experience of the choir (in that recordings of the Cathedral Choir suggest they have the ability to produce a more rounded sound). As to the Chaplain, she was indeed a woman; something was lost in translation from my submitting the report, and the excellence of MW's esteemed editor. I trust no harm has been done, or offence taken - the aforementioned priest certainly was sporting a great deal of metal-wear about her person. The original draft makes no mention of gender. The final report has been revised accordingly. I suspect Miss Amanda would Not Be Amused, though. She could always jingle her bells at them. Haha. What a wondrous image! And to "shake a leg." But...but...given that Mother Chaplain usually sports Doc Martens, even when vested in alb and chasuble, how would you see or hear these mythical bells? Miss Amanda would shoot her a glare so harsh that it would melt the Doc Martens right off her feet -- thus exposing the bells if there be any. O come over into Macedonia (aka Rochester), and help us! The nave was (as BF predicted) rather full, but still with the same older demographic of worshipers (though there were some fine African robes flashing about which brought much-needed colour, alongside the impressive knitted hangings to commemorate the centenary of the end of WWI); the worshipers were just as noisily chatty as previously experienced, though again (as heralded), there was a positive rush (I think prior to communion) of perhaps 20-30 children (and accompanying adults) who had erstwhile been enjoying their own Sunday experience in the crypt. The lovely positive thing was that the seats in the nave had been replaced [themselves replacing replacement seats] and were very comfortable; and the choir was in much better fettle, though not sure Haydn’s Little Organ Mass suited that space, as it needs to keep going at a fair lick and the acoustics mitigated against this); Vaughan Williams’ Te Deum in G (which had been sung at the preceding Matins) was exceptionally well sung. And despite assurances that the liturgy might be (anglo-)catholic-leaning, it was definitely middle of the road Anglican – acolytes, vestments, but not a hint of bells or smells, and a sense of the eucharistic event being a memorial of the last supper (an agape meal) rather than a sacramental moment. But that is only my observation and the congregation and worship leaders were certainly God-centred. It sounds like an appreciative congregation of regulars who love their cathedral -- always good to find -- even if they're a bunch of chattering oldsters. Thanks, Bunbury O Remus - interesting observations - I'm pleased to hear that the Junior Church is still present in some numbers! IIRC, they used to come in at The Peace, i.e. before the Offertory Hymn and Eucharistic Prayer. I agree that Papa Haydn's Little Organ Mass might not have been suitable (is that the one where the Gloria takes about 30 frantic seconds... ?). IME, and this may have been due to previous Precentors/Directors of Music, the choir very often seemed to offer French settings of the Mass (Vierne, Dupre, Langlais etc. ), rather than earlier 'Baroque' settings. Personally, I find the new seats in the nave slightly less comfortable than their predecessors (maybe they're a little closer together), though they're certainly of better quality generally. As regards 'Anglo-Catholic' leanings, I'm sorry if I misled you somewhat. Certainly, incense is used on High Days and Holy Days, but, yes, in general, the liturgy is MOTR (possibly like a majority of C of E cathedrals these days). I'm a bit surprised to hear that the eucharist seemed memorialist (I trust they were using an authorised Eucharistic Prayer), but that might depend on the celebrant, and how s/he acted and spoke. I still think the Bishop's Chaplain should be sent to teach the congregation how to behave with decorum and reverence! Oh, a bonus MW report. Thank you Bunbury! Ha! Two for the price of one! (Commonly seen in supermarkets around here).